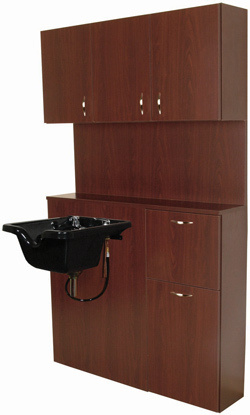 3343-45 Cameo Shampoo Bulkhead with full-width, easy-to-clean shampoo ledge, upper cabinet with three hinged doors, a tip-out door for clean towels, and lower tip-out soiled towel hamper. Pictured CB19 shampoo bowl is ordered separately. Choose from 8 popular QSE COLORS or custom-order your color for an additional 10%.